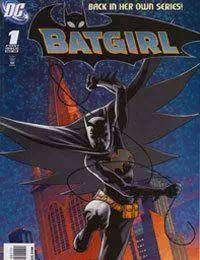 Batgirl is on the search for David Cain and Slade Wilson. She fears that she may break her oath to never again take a life. Her investigation leads her to two gun shippers who provide her with the name of a manufacturer, Armand Lester. She later returns to the Batcave to crosscheck the name in the database. Nightwing arrives, and doesnt like the idea of Cassandra having unsupervised access to the Batcomputer. The two briefly spar, but Batman and Robin arrive to break up the fracas. Batman vouches for Cassandras integrity, but adds that he is constantly monitoring her. Batgirl leaves and continues her personal investigation. Her search brings her to a factory where a costumed woman named Marque is torturing three innocent civilians.